Chief engineers are an integral part in the success of any organization. These professionals are mostly commonly found in the seafaring, public works, and product development industry. In most organizations, they are typically the most senior of all the engineers. 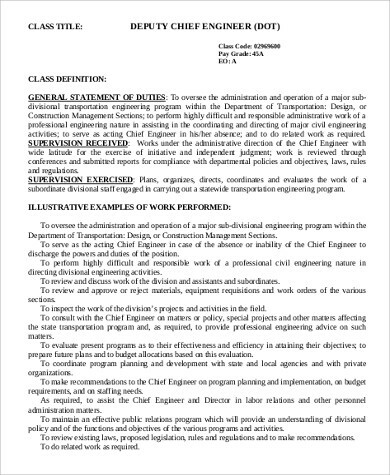 The title chief engineer often entails a number of duties and responsibilities. 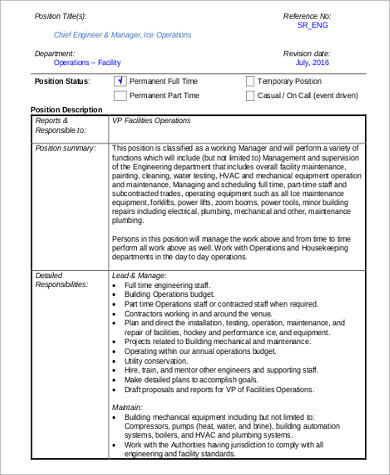 A job description would make the scope and limitations of the title much more clearer to the employee. This way, he or she knows exactly what is expected of him or her. 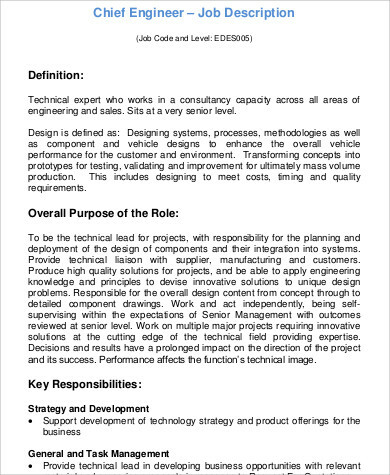 Our chief engineer Job Description Samples make drawing this line a clearer and straightforward process, so make sure to check them out. Chief engineers perform tasks that are very important to the overall success of the company. Different companies from different industries also have different requirements for this position. That is why it is important to put it in writing in a formal document so that there is no ambiguity in performing the job. 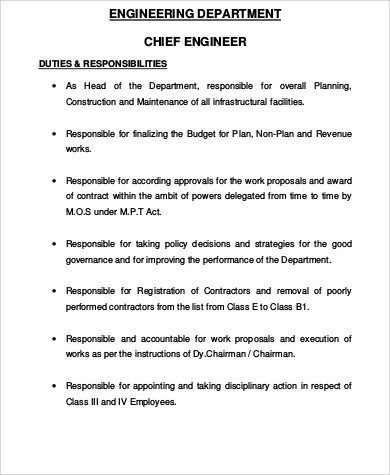 Here are the elements that should be found in a job description for chief engineers. 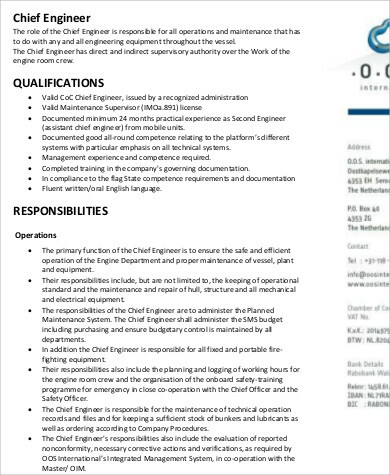 Job Title – Clearly state that the position is for chief engineer and not one for, say, a software engineer. You can instead check our Software Engineer Job Description Samples for that one. Salary Range – It is not necessary to post the exact salary here. 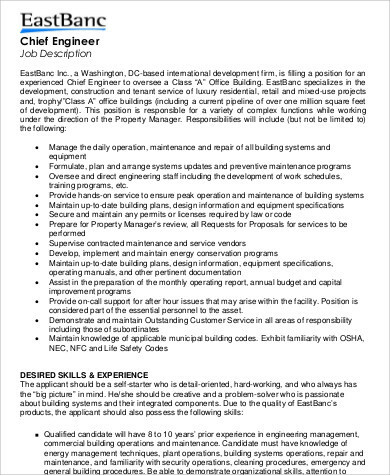 Just state the range of the expected salary for this position. Purpose and Objective – Keep this part brief and talk about the purpose and objective of the title. 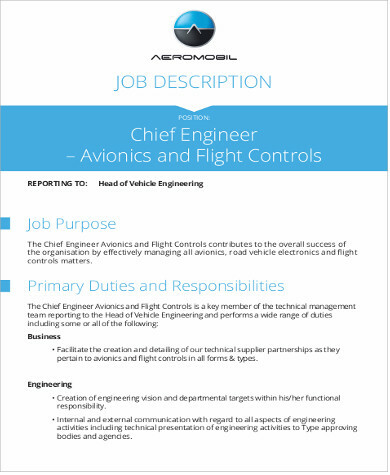 Job Description – This is where you go into detail of what a chief engineer’s duties are. 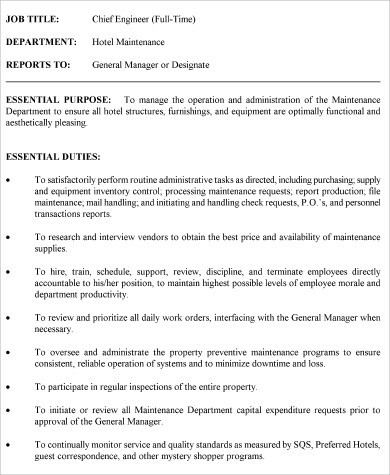 Reporting Structure – State the supervisory requirements of the role—who is supervising it and who does it supervise. 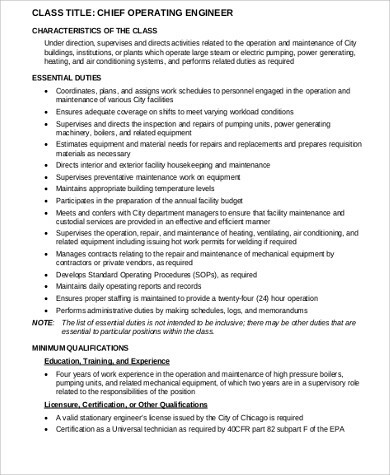 Experience and Skills – State the minimum requirements one should have to be a chief engineer and state the skills needed to do the job. Work Location and Schedule – Make clear the hours required and where the location is. Creating a job description is more than just writing out duties and responsibilities for a certain job title. There is more to it than that and so careful planning and plenty of time should be spent when doing one. Listed below are some of the dos and don’ts when making a job description. Don’t use internal terminologies. Do not put words that are too technical in a job description. Not everybody knows what the internal language is in your organization, so make sure to stick to common language so you don’t discourage potential candidates. Do collaborate with other people in the company. There are different positions that is affected by a certain job and so it is important to also consult them as to what goes into the duties of a certain role. Collaborate with HR, the management, and other employees. Do review them regularly. The workplace is always evolving. Make sure that the responsibilities of a job title also reflects all the changes happening around it. Crafting a job description helps a lot in steering an organization in the right place. 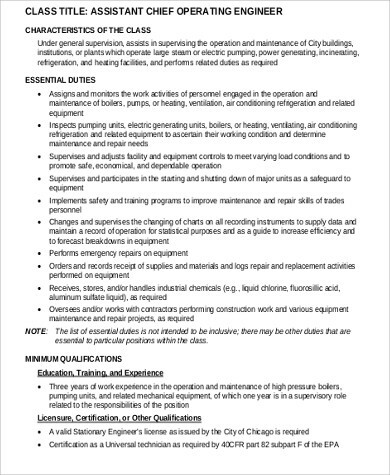 Engineers such as systems engineers need to properly read these documents and here are some Systems Engineer Job Description Samples they can look at.